AS a VFL footballer, Ray Byrne was a reliable defender, possessing a blue-collar work ethic, a good football brain and an admirable team-first attitude. As a teammate, he was much loved … and hilarious. In many ways, Byrne epitomised the sort of character every footy club needs on and off the field. He was a no-frills, dependable player: a prolific kick winner who loved to dash around the wings and create play. The fact he played in four losing VFL Grand Finals was a cruel part of his CV in a career that took him to three clubs – Carlton, Collingwood and Geelong – playing 219 games across 12 seasons. Byrne hailed from Carlton’s recruiting goldfields of Bendigo, having attended White Hills Secondary College, and he was a member of Golden Square’s 1972 premiership side. That brought about a move to Melbourne the following season to join the reigning VFL Premiers. He played only one reserves games at the start of 1973 before being brought into Carlton’s senior side. His debut season reaped 16 games, either in the back pocket or on the wing, and his three finals culminated in the Blues’ losing Grand Final side. He would be listed among his team’s best players that day. He wasn’t always enamoured with Collingwood. In his third season with the Blues, 1975, he came up against the might of ‘Fabulous’ Phil Carman. But after five-and-a-half seasons in navy blue, and midway through a turbulent 1978 season for the club, Byrne sought a new opportunity after 81 games with the Blues. His first night at Victoria Park raised a few eyebrows – he wore a Carlton jumper out on the track. But it wasn’t long before he became one of the most popular Collingwood players, among a group of second-chance players who would go on to become part of those ‘Hafey’s Heroes’ teams. He first wore the black and white against Hawthorn in Round 14, 1978, the first of what would be 121 games with the club, wearing the No.26 jumper. The 1978 finals records described him as “capable of surprising with a top display”, and he played in three finals that season, including against his old side Carlton in a first-semi-final. It was the first of four successive finals campaigns for him at Collingwood, which included three Grand Finals losses in a row (1979, 1980 and 1981). Mostly used as a back pocket and half-back flanker, and occasionally on the wing, Byrne was a cool customer under pressure, even in the heat of his 22 finals. One of his best performances came when he blanketed Geelong’s Terry Bright in the 1980 preliminary final. That was his best individual season, too, as he finished runner-up to Peter Moore in the 1980 Copeland Trophy, won the club’s most determined award, and was selected to play for Victoria. Byrne was a practical joker of the highest order, bringing humour to even the most awkward of situations. When he played on Kevin Bartlett in the Richmond great’s 400th league game, he congratulated the balding Tiger on his milestone and presented him with a comb with its teeth cut out. In an earlier final against Geelong, he sought to pay a lost bet to Cat Stephen Lunn by pulling out a $50 note from one of his socks. 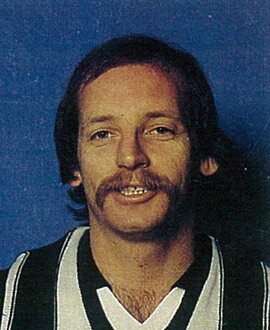 The popular Magpie announced his retirement from league football at the end of the 1983 season, choosing to move down the highway to Geelong. What he hadn’t reckoned on was Hafey’s persuasive powers. His former Magpie coach was now coach of Geelong, and he somehow convinced Byrne to overturn his retirement and play one last season with the Cats in 1984. His 17 games with the Cats took his overall career tally to 219 games, with the most difficult coming against the Magpies at Victoria Park. Byrne’s link to Hafey shaped him as a footballer, and later as a successful coach in country leagues and in Queensland as well as stints as a regional manager of elite under 18s teams. The same could be said for Ray Byrne.